Last updated 12/12/2013 by David Giblin. Publication: Native Orchids U.S. & Canada. 225. 1975. Notes: FNA26: " Platanthera dilatata traditionally has been divided on the basis of spur length into three varieties, one of which, var. leucostachys, is sometimes treated as a distinct species. These infraspecific taxa seem to reflect differing pollination pressures. The moderate spur length and diurnal fragrance of var. dilatata suggests adaptation to diurnal Lepidoptera; the long spurs and primarily nocturnal fragrance of var. 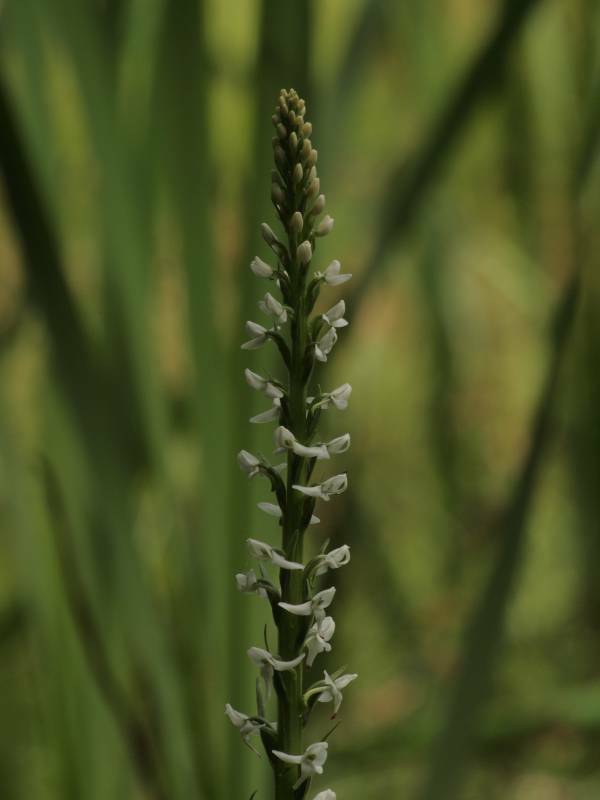 leucostachys indicates specialization for moth pollination, and the short spurs and often broader viscidia of var. albiflora suggest a broader range of pollinators or, in extreme cases, specialization for bee or fly pollination. Alone, these characteristics might support recognition at the specific level, but intermediates and populations with variable spur lengths are abundant. In some plants in western Canada, in particular, spurs that are very short when the flower is young grow to equal the lip as the flower ages, and in some they may eventually greatly exceed the lip, thereby simulating all three varieties. Plants with short spurs, either thick or variably slender, occur occasionally across the range of the species. In the southern Rocky Mountains spur reduction reaches an extreme, yet populations with moderate-length spurs occur there as well. In the broad sense, then, P. dilatata forms a cohesive unit in which spur length varies greatly, apparently in response to differing pollination pressures. The northwest is the center of variability of the species, and as it ranges eastward through the boreal forest, and southward down the Rockies and the more western ranges, it appears to have specialized for different pollinators. The recognized varieties of P. dilatata are evidentally merely endpoints in a very complex variation pattern. They have some utility for discussion purposes, but they are very simplistic representations of the underlying situation. Variety leucostachys and, to a lesser extent, var. dilatata appear to be real entities that have emerged from a background of variability that continues to produce similar plants. This variability is here treated within var. albiflora. Platanthera dilatata hybridizes with P. huronensis and P. purpurascens, and perhaps also does so with other related species; see the note under 10. P. aquilonis."